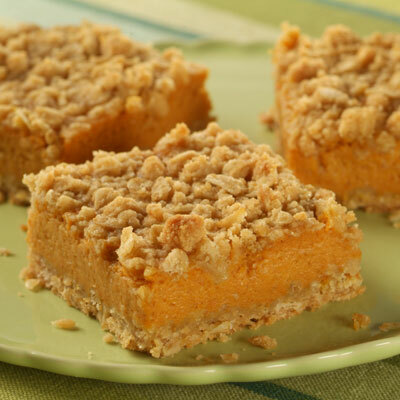 Pumpkin and cream cheese combine for a creamy filling that is topped with nutty streusal topping. Dress it up with whipped cream for a pretty ending to a meal. COMBINE flour, oats and brown sugar in large bowl. Stir in butter until moistened. Reserve 1 cup mixture for topping. Press remaining oat mixture onto bottom of prepared pan. BEAT cream cheese, granulated sugar, cornstarch and pumpkin pie spice in large mixer bowl until smooth. Beat in eggs. Beat in pumpkin pie mix. Pour over crust in pan. Sprinkle with reserved oat mixture. BAKE for 45 to 50 minutes or until knife inserted in center comes out clean. Cool completely in pan on wire rack. Refrigerate for 1 to 2 hours. Serve with whipped topping or ice cream, if desired.